Āryadeva (fl. 3rd century CE), was a disciple of Nagarjuna and author of several important Mahayana Madhyamaka Buddhist texts. He is also known as Kanadeva, recognized as the 15th patriarch in Chan Buddhism, and as "Bodhisattva Deva" in Sri Lanka. Aryadeva was born as the son of a Sinhalese king and is considered the cofounder of Mahayana philosophy. A biography that was translated by Kumarajiva into Chinese states that Aryadeva was born into a South Indian Brahmin family. Aryadeva was a student of Nagarjuna and contributed significantly to the Madhyamaka school. According to the Drikung Kagyu school of Tibetan Buddhism, Garchen Rinpoche is the current incarnation of Aryadeva. Most of Aryadeva's works were not preserved in the original Sanskrit, but they mainly survived in Tibetan and Chinese translations. His best-known text is probably the Catusataka (400 verses), in sixteen chapters of twenty-five stanzas each. 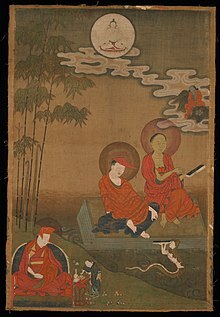 Several important works of esoteric Buddhism (most notably the Caryamelapakapradipa or "Lamp that Integrates the Practices") are attributed to Aryadeva. Contemporary research suggests that these works are datable to a significantly later period in Buddhist history (late ninth or early tenth century), but the tradition of which they are a part maintains that they are (at least in some measure) the work of the Madhyamaka Aryadeva. Traditional historians (for example, the 17th century Tibetan Tāranātha), aware of the chronological difficulties involved, account for the anachronism via a variety of theories, such as the propagation of later writings via mystical revelation. A useful summary of this tradition, its literature, and historiography may be found in Wedemeyer 2007. Catuhsataka-shastra-nama-karika (the Four Hundred Verses) was translated into English by Karen Lang as Aryadeva's Catuhsataka: On the Bodhisattva's Cultivation of Merit and Knowledge. Snow Lion Publications published the Four Hundred Verses as The Yogic Deeds of Bodhisattvas: Gyeltsap on Aryadeva's Four Hundred, Commentary by Geshe Sonam Rinchen, translated and edited by Ruth Sonam (which also includes an English translation of bzhi brgya pa'i rnam bshad legs bshad snying po, a commentary by rgyal tshab dar ma rin chen, 1364–1432). A republished version thereof (Shambhala/Snow Lion, 2008) is Ruth Sonam (tr. ), Āryadeva's Four Hundred Stanzas on the Middle Way: with Commentary by Gyel-tsap—Additional Commentary by Geshe Sonam Rinchen ISBN 9781559393027. Hastavalaprakarana (Hair in the Hand) is sometimes attributed to Dignaga and was translated to English as On Voidness. A Study on Buddhist Nihilism by Fernando Tola and Carmen Dragonetti. ^ Women of Wisdom by Tsultrim Allione, Shambhala Publications Inc, p. 186. Lang, Karen (1986). Aryadeva's Catuhsataka: On the Bodhisattva's Cultivation of Merit and Knowledge. Narayana Press, Copenhagen. This Buddhist biography-related article is a stub. You can help Wikipedia by expanding it.